What girl doesn't love jewelry?! 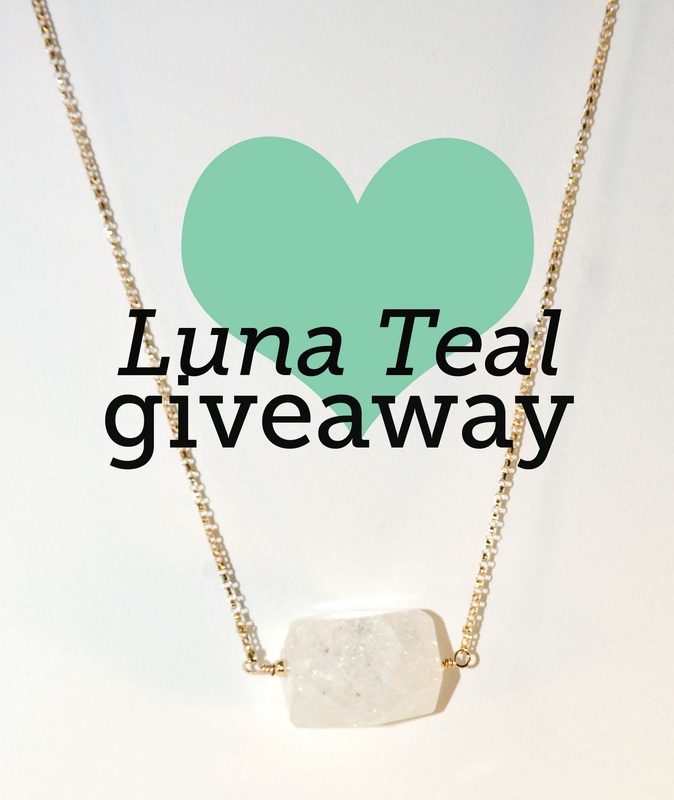 I've partnered with Luna Teal Jewelry and we're giving away this beautiful necklace. Luna Teal has a lot of pretty and delicate pieces. This necklace ( Pet Rock ) is my favorite. Make sure to check out her blog and Twitter to learn more about her lovely collections. Pet rock is also available in other colors! This contest ends next Wed at midnight Pacific Time. Can't wait to see if you win? Luna Teal is offering Sterling Style readers 30% off any purchase. Enter the discount code STERLING at checkout. Starting tomorrow through Feb 28th. jessaubuchon@gmail.com Congrats you are the winner! Well I'm totally lusting after long earrings (which is why I'm finally growing my hair again) so my favorite piece is the COUNTESS EARRINGS. Thanks for introducing us to a great jewelry site! My favorite piece is also The Roxy (http://www.lunateal.com/index2.php?v=v1#/gallery1/2/), but the Pet Rock necklace is adorable! My Favorite Piece is Smolder. What a great give away. i really like the city girl pearls! I love the city girl pearl earrings. Lovely shop. My fave piece from her shop is: The Lola Cuff! So lovely and colorful! cool giveaway!! love the jewelry! i like the butterscotch sky necklace. loving gold lately. My favorite piece are the Countess earrings! Absolutely gorgeous! LOVE the City Girl and Smoke'n Pearls! Very pretty! I also like the pet rock necklace in blue. so excited about this giveaway! the Pet Rock is stunning in its simplicity-definitely my favorite! love it. That necklace is gorg! My favorite piece is the "Roxy" necklace. Beautiful stuff! I love the butterscotch sky necklace! Such beautiful stuff! Loving the City Girl Pearls! I'm lusting after the Lola cuff, so bright and colorful, it makes me happy! Awesome giveaway! I'm in need of an everyday necklace! Gah can't pick- I love the City Girl earrings and the Pet Rock necklace! my favorite is the pet rock necklace. it's so simple and beautiful. I love the City Girls Pearl necklace in gold. So pretty! They're all beautiful, but I think "Butterscotch Sky" is my favorite. beautiful necklace! i also like the lola cuff! that's such a lovely necklace! The countess earrings are gorgeous! The symmetry of the chain design along with the assymmetry of the kyanite & lolite makes for a very classic earring. I really love the Pink Sugar bracelet! i like the roxy necklace. beautiful. My favorite piece is the Butterscotch Sky! I love the Raspberry Wave earrings, such delicate hoops with a bold surprise, love them! I love the Butterscotch Sky necklace. my favorite is actually the neckalce you are giving away! I love the butterscotch sky necklace! SO excited! I love the Starlight earrings. My favorite piece is a tie between the one you're giving away and the roxy necklace, would look adorable with many outfits!! lauren.ash.brenner at gmail dot com! Great giveaway! My fav are the Countess earrings :) All her pieces are beautiful! I am loving that necklace, my favorite piece in her collection would have to be the Lola cuff! My favorite piece of jewelry is Natural Beauty! I love the colors! I like the Pet Rock Necklace. what a lovely feminine piece! My favorite is the Pet Rock necklace! Simple, yet sophisticated! I love the city girl pearls earrings. I like the Pet Rock necklace! I think the Pet Rock is my favorite too! MY favorite piece of jewelry is the Butterscotch Sky! Thanks for the giveaway! the pet rock necklace is definitely my favorite :) so cute! oh my goodness beautiful stuff!! Very pretty jewelry! I really like the pet rock necklace. i love the countess earrings! I am loving the Roxy necklace! I NEED that necklace! Seriously perfection in my book! Love the entire collection - but love, love, love the Roxy necklace! The City Girl pearls would be my pick! Hi! I visited the sponsor's wonderful website and absolutely loved their Butterscotch Sky Necklace. Thank you for hosting this giveaway. My favorite piece is the gold Circuitry hammered cuff/chain bracelet! i love the countess earrings or the circuity bracelet!! What beautiful work! I especially love the smolder necklace-gorgeous! I think "PET ROCK" and "NATURAL BEAUTY" are so awesome! I like Leslie's "Gravity" earings. Reminds me of my birthstone, the peridot. I think the pet rock is my first pick, and the Starlight earrings are my next choice. The limited edition dragonfly earrings have got to be my absolute favorite! Okipko@hotmail.com my favorite piece is the pet rock necklace! The Pet Rock necklace is my favorite too! Butterscotch Sky is so pretty! I have to agree with you, the Pet Rock Necklace is my favorite!! Such a gorgeous piece! My favorite piece in her shop has to be the 'Natural Beauty' necklace, which is quite similar to the 'Pet Rock' one you posted, so gorgeous! oooo these are so great! I love the Countess earrings, so gorgeous. My ultimate pick is the Crash, Boom, Bang Bracelet. It's sweet and delicate, but definitely a statement piece. Love Love Love Pet rock!!!!!! my favorite is the butterscotch sky necklace. love her jewelry!! I love the Pet Rock necklace! My favorite piece is is the Lemon Drop bracelet. So pretty and simple! I love the city girl pearls necklace--so elegant! I love the pet rock necklace best! I am in love with the LimeLight necklace and the Roxy necklace. I like the pet rock necklace too, very pretty. I love discovering new sites to browse and shop at. I like the butterscotch sky necklace. It looks very versatile and has a delicate feel. They are all beautiful, but I love the smolder necklace! I love the Pet Rock w/ crackle quartz in 14k gold...just as you show it :) SO CUTE! Love the Roxy necklace! thanks!! I really like the "Lola" cuff. It's gorgeous. Obsessed with the Pet Rock necklace! The dragonfly earrings are unbelievably beautiful. And they'd make a great valentine's day gift to myself. Thanks fo rthe oppurtunity! I love the Pet Rock Necklace in Aqua Quartz, the gold and the light aqua is such a lovely color combination. That's such a pretty necklace! I also love the City Girl Pearl necklace!! I am really into simple necklaces at the moment so my favorite piece has to be a tie between Butterscotch Sky and Pet Rock!! Love them!! I'm loving the butterscotch sky necklace! I like the city girl pearl earrings - so gorgeous. Oh my! What a beautiful necklace! I also adore the City Girl Pearls. That necklace is perfection! I also love the simplicity of the Circuitry bracelet and think it would make a wonderful accompaniment to the necklace. The city girl pearls are adorable. Pet Rock (particularly the stone/color you've featured) is so lovely and would look amazing with a breezy sundress and strappy sandals this spring! Ah, stunning! My faves are tied: the Lola Cuff and the Pet Rock necklace in that gorgeous sky blue. ooh..the Lola cuff is exquisite.. Perfect for Spring, summer..pretty much all year round..
my favorite is the Om Chinese Turquoise, sterling silver wire, clasp & Om dangle. I like that it has a vintage, passed through many generations feel. I love the Crash, Boom, Bang bracelet! awww I love the quartz, gorg! I like the smolder necklace. I would wear it with so many outfits. Actually the Pet Rock necklace is my favorite! Love the simplicity of it! Love the look and the name of Pet Rock necklace! Thanks for the give-a-way! I love the smolder necklace. my favorite peace is definitely 'butterscotch sky', quite a classic necklace like 'pet rock'. I like the butterscotch sky necklace! I love the gold circuitry bracelet! I like the Roxy necklace!!! Great giveaway! Along with the pet rock necklace, I absolutely adore the city girl pearls! My favorite is the "limelight" necklace, what a beautiful color! There are a lot ofpretty options, but I really like the "pet rock" necklace too. So original and very pretty!!! I'm pretty in love with her "Natural Beauty" stone necklace. This giveaway is awesome!